On this Sunday the liturgy tries to capture two moods: the exultation of the crowds proclaiming Jesus as the king as he enters Jerusalem and the sorrow that comes from seeing Jesus dying on the cross abandoned by all his disciples. The mood of the liturgy quickly shifts from one mood to the other. 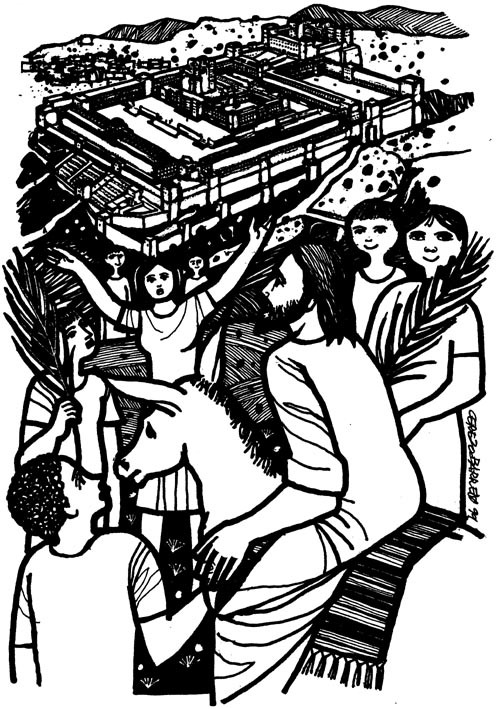 As we recall the triumphant entry of Jesus into Jerusalem, we raise our voices with the crowds who cry out, “Hosanna! Blessed is he who comes in the name of the Lord!” But then as we listen to the reading of the Passion according to St. Mark, we imagine to the pain and suffering that Jesus endured as he made his way to Calvary. Not only was there physical pain, but also the sense of abandonment and so many other emotions he experienced. His sufferings were real. As a human being he experienced the strong emotions and physical pain of man who had been beaten and abused and was then led to execution. As always, the Scriptures invite us to enter into the scene. A traditional form of meditation on God’s Word asks us to find our place in the scene. What do you see? What do you hear? What do you smell? What are you experiencing? How does it make you feel? We can do that with this Sunday’s two gospel readings. Take some time to meditate on the triumphant entry to of Jesus into Jerusalem that we hear at Mass on Palm Sunday (Mark 11:1-10). Where are you in the story? Are you one of the disciples sent to fetch the colt? Are you bystander who just watches and wonders? Are you part of the crowd shouting “Hosanna”? How are you feeling as you witness this event? How does it impact you? It would be well for us to give some significant time to meditating on these long and rich scripture passages. One hearing at Mass is not enough. We can go scene by scene and, in each case, try to find out place in that scene. What a wonderful way to begin Holy Week. I am reminded of a homily I read one time. The priest wrote: The people who shouted “Hosanna! Hosanna!” on Palm Sunday were the same ones who five days later shouted “Crucify him, crucify him!” Let us prayerfully and honestly examine ourselves and find our place in the story of the Lord’s passion and death. “The hour has come”. These words capsulize the final emblem of the gospel this fifth Sunday of Lent. The ultimate time for Jesus to face his death is gearing nearer. His crucifixion and death is the only pathway to his resurrection and ascension. But among the three signs of the gospel, death is more understood as reality that everyone has to face. It is always a painful human experience. Even Jesus was perspiring with blood as he anticipated the painful end destined for him. Thus, by looking back at the death of Jesus we also learn to understand our end. The mental suffering is unimaginable, yet we can relate to it in our daily sacrifices for our loved ones. The sufferings becomes a routine that makes us struggles in gasping the essence of Jesus’ resurrection and ascension after his cruel death. The afterlife can only be a courageously faced with faith after all, no one has come from the tomb and lived again. And the more that no one has seen a person who ascended to heaven. Thus to hold on to the teaching of resurrection and ascension is purely faith. John, in his gospel is depicting the “Jesus” who is willing to lay down his life in total surrender to his destiny. This is the essence of discipleship, which we are all called to be. The gospel is telling us to face our “final hour” for it is the only way to be one with Christ in the glory of his resurrection and the ascension. The Lord knows our fears and struggles by heart that is why to believe by heart that is why he continues to remind us to become fruitful up to this “final” hour. Jesus does not want us to focus on his death, but on the glory that awaits beyond death. By showing that he overcame the power of darkness, the light of his resurrection will envelop every heart to face the “final hour” with total surrender. 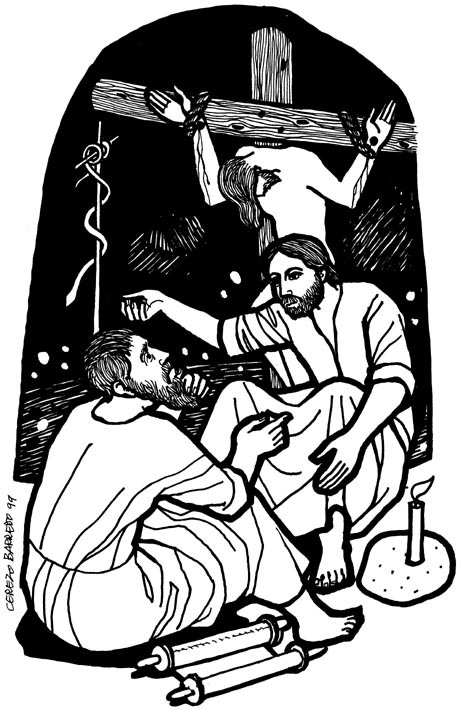 Thus in the gospel, he spurred his disciples to become fruitful by having constant connection with him like the vine and its branches. The seed has to die and fall into the earth before it germinates into a new plant and eventually bears fruits as nature created it. In the same way we are called to die from our indifference; to fall into the ground, and soiled to remind us that we are from the dust and that we must humble ourselves in order to bring our union with God into perfection. We must die from our indifference towards the spiritual salvation offered to us by Jesus by feeding the hungry, tending his flock that are scattered and wounded in the periphery. We need to learn to abandon our own “final” hour to him who chose to offer first his life to ease all our fears and doubts in adhering to God’s promise. We don’t need special audience with Jesus like the Greeks in the gospel for he has been with us from the onset of our life. Rather, we have to look into the core of our being where Jesus has been gently impelling us to move on in our quest to be with him in the house of his father. There is no other special and precious time we could think other than what Jesus has been spending patiently with us every day up to the “final hour” of our existence. Lord we humbly ask your grace to make us brave enough to die every day from our self-centeredness. May we learn to humble ourselves as we look at your cross - the sacrificial emblem of your unconditional love for all of us. Amen. Man continues to perish with his ill-choices. Choices that have brought him to a cycle of sin and into the “abyss of misery.” St. John Eudes says that God was moved by our misery. He writes: “the Father of mercies and the God of all consolation, ... is carrying all our sinfulness and wretchedness in his Heart ; that they touch him very closely ; and that if he were able to suffer, he would feel incomprehensible pain ; and that he has an infinite desire to free us from our sinfulness and to make us sharers in his eternal happiness.” And that the "In order to deliver us from the deepest abyss of misery … and to raise us up to the greatest degree of happiness, the divine mercy wanted the Son to become a man like us, mortal and able to suffer like us …." On this Fourth Sunday of Lent—“Laetare Sunday,” this very same message resonates in today’s “gospel in a nutshell”: “God has loved the world so much, that he gave his only Son, so that everyone who believes in him may not perish, but may have eternal life.” Rejoice! What good news indeed! The merciful Father seeks our salvation through Jesus. God who has “loved us first” continues to love us even as we continue living our lives in obstinacy and sin. He offers us His Son and desires that we “look upon him whom they have pierced” that we may find healing. We are all broken and wounded. We have been bitten by the snakes of pride and self-centeredness and we continue to lick our wounds hoping that we can get healed. Jesus is offered to us but this requires us that we gaze at him—to believe, to trust, to surrender in Him. And as we look to Jesus, the Light, our own shadows will be revealed to us. Frightening, for we may realize how hideous we may have become. In spite of this, Jesus loves us constantly and unceasingly. Lest we condemn ourselves, we need to confront the inconvenient truth that we need to change and be transformed from a life of self-centeredness to a life of selflessness. Now is the day of salvation. Believe! Prayer: Lord Jesus, your light reveals to my darkness. Save me, O Lord and grant me the grace to live in the light of your truth and love. Amen.